Steven and I are exhausting the library of documentaries and shows available on Netflix instant. It's our TV, since we don't have cable and I love it! No commercials and a really good variety of things I probably wouldn't have ever thought to watch. 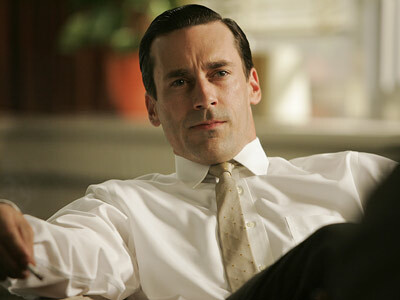 My newest obsession is Mad Men. I'd heard of the show, but had no idea what it was about, who was in it. I was clueless, but when I read the first episode description I knew I'd like it. Little did I know I'd be obsessed with it. Not many shows grab my attention to where I'm caught up in a story line like it's my own life, but I figured I'd blog on it today since I went to bed completely angry. I was laying there thinking, "What am I so mad?" I realized I hated the last episode and how the main character continues to disappoint me with his actions. See....you know they have good writers when they can get you to feel like that after you go to bed. Character development is very important in this series and so it takes a while to understand the characters...in fact I still haven't figured out Don Draper. The main man. This guy is a workaholic, alcoholic, some 'other'aholic (not yet proven) and you love him. And then you hate him. He's a charmer. Intense and gets his job done. He's the guy in high school you weren't supposed to like because he would reel you in and spit you back out. He's an amazing ad man in New York and you're constantly trying to figure out where his head is at and why he does what he does. That's the frustrating and inciting part. His character, played by Jon Hamm is confusing and endearing all in the same sentence. The beauty on the show, played by January Jones, she is married to Donald Draper. She's young, beautiful and has 2 kids. The moment you start this series you fall in love with her. You feel sorry for her because of all the things going on, but you realize she has another side as well. Her past seems to cloud her judgement and frankly, she comes across many times as a child, pouting. You can tell she hates her life as a housewife...she's bored. It's very interesting to watch the interaction between husband and wife during the 50's and 60's. Totally different than today's "normal" household. It took me a while to dig into who she was and why she was. Now, she's one of my favorite characters. 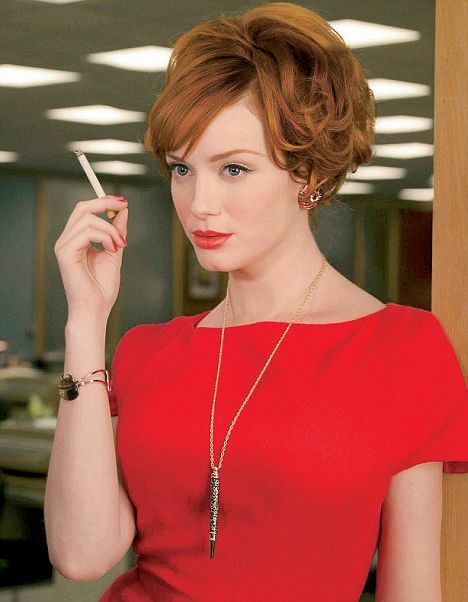 Strong, sassy and seductive, she runs the secretary pool at SterlingCooper (the ad agency Don works for). She's a bit scandalous and over the top in outfit and suggestion, but she knows what she wants. She's out to get it. I appreciate that. This is a man you love to hate if you're a woman. He's a chauvinist who thinks all women are good for is pleasure. As his character develops and his "jerkiness" seems to reach it's peak, you end up finding parts of this character that you can't help but laugh with. He's quirky and quick in his retorts. He'll eventually get what's coming to him and he wouldn't be marriage material, but his sharp tongue and quick wit keep him in the drivers seat of his company. Sweet, sweet Peggy. She's a simple girl, with a simple life and a simple way of thinking. With some good luck, good charm and fate she quickly becomes a star on the show. Her character while rather confusing on the decisions she makes and then men she decides to sleep with make you question her sanity, her awkward and spacey approach to life is almost refreshing after getting pulled into the spider-web of personalities on this show. If you want drama (basically a well-written soap opera) this is the show for you. It's so complex and not cliché that we usually watch 2-3 episodes a night. Yes, we're hooked!